The Moto E5 Plus is one the affordable smartphones that Motorola plans to launch in the coming months along with a trio of Moto G6 series handsets. It's true that this isn't the first time we report about the Moto E5 Plus, but we never had the chance to see what the phone looks like for real. 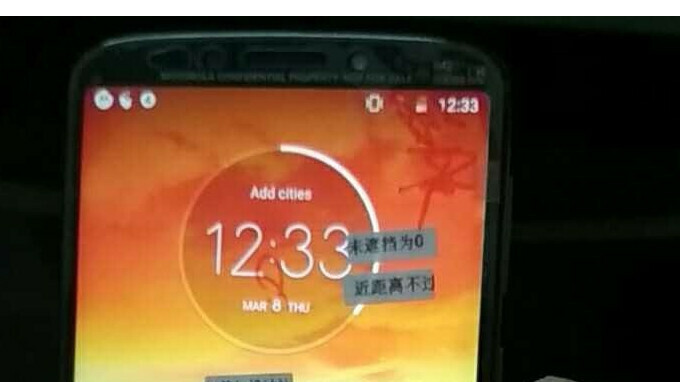 Apparently, two pictures of the phone have just been leaked from China, each image showing two different parts of the Moto E5 Plus – the front and back. From what we can see, the Moto E5 Plus features a single rear-camera and fingerprint sensor hidden underneath the Moto logo. The large 5.8-inch HD+ (720 x 1440 pixels) display features an 18:9 aspect ratio, which isn't at all unexpected considering the trend. A front camera is visible as well, but other than that we can't get any other info from the pictures. Although it's supposed to offer a premium feel, the glossy back plate seems a bit of a fingerprint magnet. The Moto E5 Plus is expected to be introduced in May/June, but Motorola has yet to make any announcements regarding its new lineup of smartphones. For entry level, it looks pretty impressive to me. Usually moto is about a year behind on design but this looks like the standard. 'The glossy back plate seems a bit of a fingerprint magnet' Um what? Judging from that photo, it is a heck of a lot less of a fingerprint magnet than my Note8 or iPhone X. The back camera design looks like the head of some masquerades here in Africa. I just bought a home, so excited, it comes with all sorts of smart home bells and whistles. I'm actually contemplating buying maybe three of these phones as additional home remotes for around the house... assuming that the battery life is anything near the Moto 4E Plus. I just wish that they would come with wireless charging... Oh well. An older or inexpensive Android smartphone are great as a remote for a TV as well. You can use a Google Home to view YouTube videos, Movies, play music, but sometimes you want to see or browse the web first and then cast that information to the TV, including web pages. That is true... Though my Moto X (2013) has a cracked display and my Nexus 6P's battery is inexcusably poor. I think a new budget device with a massive battery is the way to go. I'm already investigating various smart home products and functions that I can possibly play around with, light/light switches, wi-fi enabled receivers for the TV/sound system... LOL, I'm going to need to get another job to pay for all this stuff. Looks pretty decent for an entry level phone, but how good (or bad) are Moto with the updates these days? If bad, you might as well get a guaranteed "updated for two years" Android One phone instead.